I found this story in a recent CNN article. Five year old Aidan Reed was diagnosed with leukemia in September of this year. Aidan immediately began treatment. With a new baby at home (born 12 days after Aidan's diagnosis), his father had to take leave from work to help out. Financially, things quickly got bad for Aidan's family and they even discussed having to sell there house. 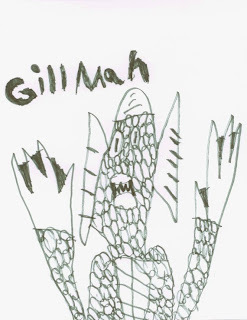 Aidan loves to draw and he loves to draw monsters. (To the right is Gillman, one of Aidan's favorite monsters to draw.) After his aunt received some of his drawings, she had an idea of how to financially assist Aidan's family. She set up an Etsy account called Aidan's Monsters and began selling Aidan's art. For those of you not familiar, Etsy (one of my favorite websites) is an online forum for people to sell there homemade art, clothes, jewelry etc. 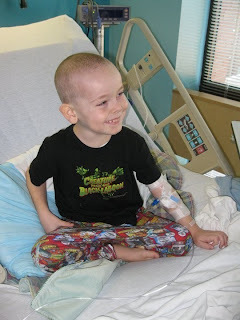 Aidan's monsters were so popular that the family made $83,000 in just a few weeks. You can see more of Aidan's art on his blog. A few things I found interesting about this story. First is the very clever use of Etsy for fundraising (again, one of my favorite websites). Aidan's aunt is only selling the pictures (prints) for $12 each and managed to sell around 7000. Another thing was the obvious parallels people were making with Aidan drawing monsters while fighting a "monster" himself. I even read somewhere that the monsters were some kind of subconscious manifestation of his fight. Really? Can't he just be a five year old boy who really likes to draw monsters. Wouldn't that be a much more likely explanation. Reading this story also introduced me to a series I hadn't read on CNN.com, entitled Empowered Patient. It was started by Elizabeth Cohen after her newborn daughter accidentally got an unnecessary spinal tap. She writes on different topics like how to get the most out of your doctors visit and how to talk to children about illness.